All images and characters ™ and © Marvel. Every once in awhile, I like to revisit stories which inspired me to become a writer. Do those stories still hold up? What fresh insights can I glean from the choices those writers made? 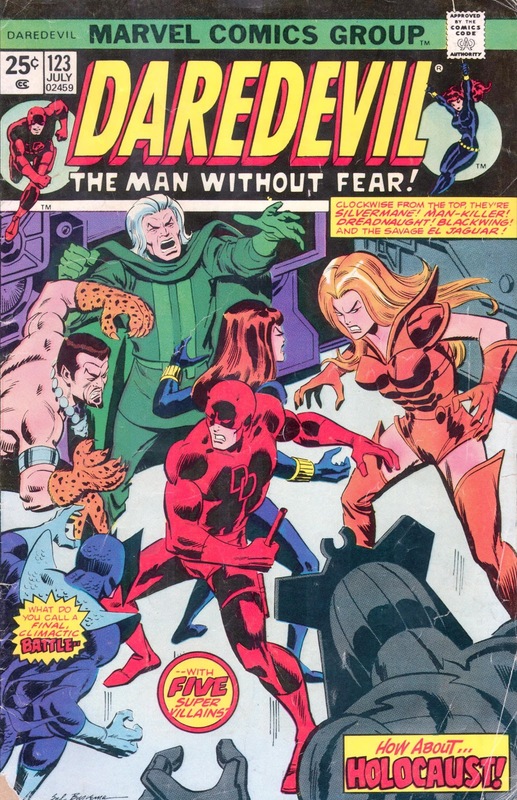 This week’s offering: Daredevil # 120-123, April-July 1975, written by Tony Isabella and drawn by Bob Brown (who are both credited as “storytellers”) with inks by Vince Colletta. 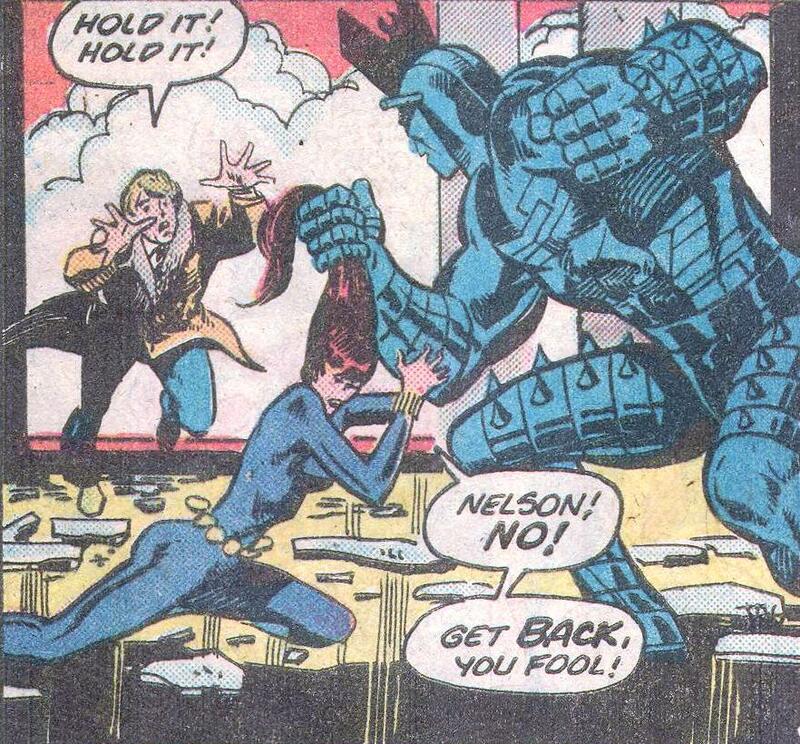 I was never a huge fan of Daredevil. Basically, he’s a costumed acrobat with the gimmick of being blind and having to rely on a “radar sense” to get around. He also swings from rooftop to rooftop on a cable connected to a billy club, which makes him part Spider-Man and part Batman. 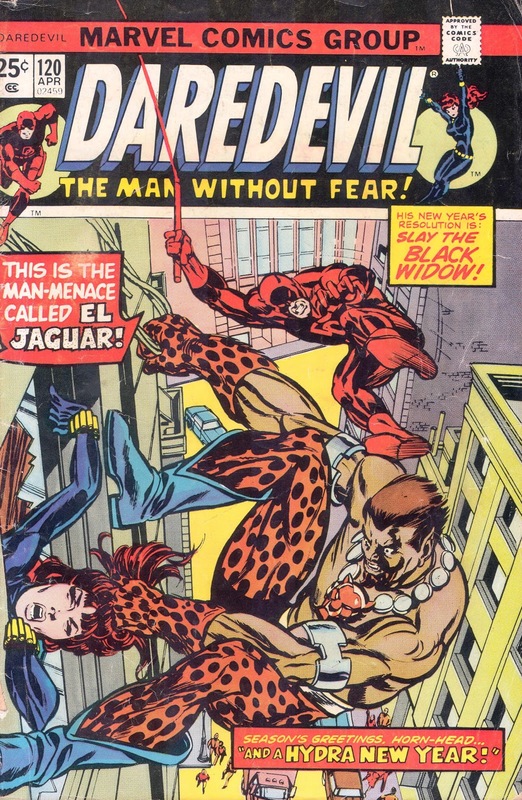 Nevertheless, my first exposure to Daredevil turned me into an unlikely follower of the series. These four issues showed how good writing can win over fans with an exciting story, a multi-layered plot, interesting villains, and a sense of heroes belonging to a larger community. The premise of this arc, as indicated by the title of # 120, is as follows: Matt Murdock (Daredevil) and his lady love, Natasha Romanoff (the Black Widow) attend a New Year's Eve party which is interrupted by the forces of HYDRA, a green-clad army bent on taking over the world. HYDRA wants to kidnap Matt’s best friend, New York District Attorney Franklin “Foggy” Nelson. DD and the Widow intervene (reluctantly on her part, since Foggy previously gave her good reason to hate him – something to do with a trumped-up murder charge), and then Nick Fury and his agents of S.H.I.E.L.D., a paramilitary spy organization and long-time enemies of HYDRA, show up to reveal why the bad guys wanted to kidnap Foggy: to prevent Fury from offering the portly D.A. a job on S.H.I.E.L.D.’s advisory board. Of course, I didn’t fully understand or care what all this was about at the time. What drew me into buying these issues was something far simpler: the villains. Every hero needs good villains, and heroes with colorful rogues galleries – such as Spider-Man, Batman, and the Flash – benefit from recurring enemies who become almost as popular as the heroes themselves. HYDRA at this point employed several super-villains as “division chiefs” – El Jaguar, Dreadnought (or Dreadnaught – it’s spelled both ways), Blackwing, Mankiller, Jackhammer, and others – a cornucopia of villains in one story line! How could I resist? Unfortunately, these villains never became a Daredevil rogues gallery – few returned to fight DD again – but the promise was there. How can you not like Sal Buscema's cover for # 123, which shows the villains ganging up on our heroes? We’ve just got to find out what happens. 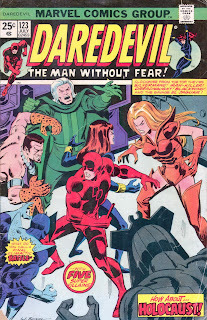 But, after luring me into buying Daredevil with enticing villains, Isabella and Brown went further. They made me care about DD and his circle of friends and associates. 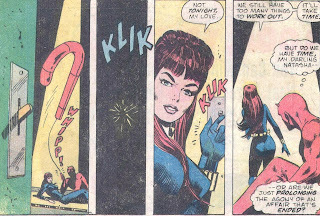 The Black Widow, then series co-star (her picture appears on the title banner, along with DD), provides much of the depth and drama of this arc. I was too young to pick up on the nuances of their relationship, but it was clear things were not working out. DD was constantly saying the wrong things – he had trouble accepting Natasha as a full and equal partner in their super-hero adventures. For her part, Natasha was used to being a strong and independent woman at a time when women’s lib was still a relatively new concept. She was Mary Tyler Moore in blue spandex. 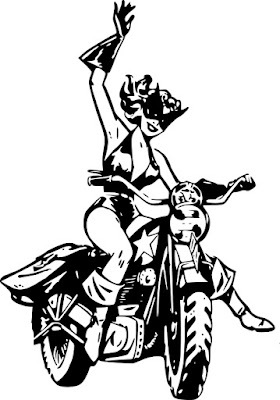 She felt she was losing part of herself by becoming DD's “sidekick”. Yet Isabella affords us scenes in which the two lovers flirt, play around, and simply talk about their relationship. We get a sense that they do love each other. When DD realizes he cannot change to accommodate her, it’s heartbreaking. Matt and Natasha struggling to work things out -- from # 121. If any character qualifies as Daredevil’s sidekick, it’s Foggy Nelson. He doesn’t know his best friend’s a super-hero, and he’s lovable, silly, and overweight – all the stereotypes of a sidekick. Foggy to the rescue -- also from # 121. And Foggy has the good sense to turn Fury’s offer down. After surveying the damage done by S.H.I.E.L.D.’s battle with HYDRA to Shea Stadium, Foggy decides that overseeing a super-spy organization isn't for him. This arc also makes good use of supporting characters who connect Daredevil to the larger community in the Marvel Universe. Nick Fury and his own sidekicks (Dum Dum Dugan and the Contessa Valentina Allegro de Fontaine) play significant roles, as does the Black Widow’s chauffeur and bodyguard, Ivan. These characters bounce off each other, providing humor and interpersonal drama, as well as helping to advance the plot. Though he does not appear, Spider-Man is referenced a couple of times. 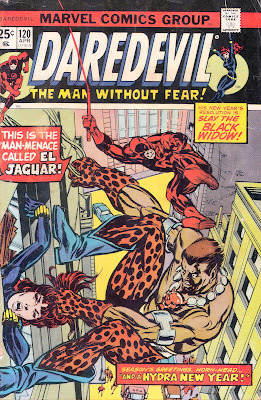 When Daredevil senses El Jaguar climbing up a building, he at first thinks the newcomer is Spidey. And HYDRA's mysterious new leader turns out to be an old Spidey villain, Silvermane. In later eras, too many crossovers and references to past stories in other series could overwhelm comics stories, making them difficult for new readers to follow. This story gets the balance just right. And What of DD Himself? If subsequent issues of Daredevil proved underwhelming, it’s because Isabella and Brown did such an outstanding job here. This arc provides the turning point in DD and the Widow’s relationship – she would leave him and the series just one issue later, in # 124. 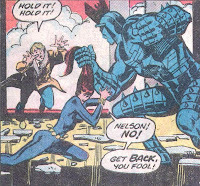 Daredevil on his own – as a self-pitying, self-accusing hero – was never as interesting as when he played off her. But make no mistake: Daredevil stands out as the main character here. We care about him, both as he places himself in danger to stop HYDRA and as he tries to work out things with Natasha. The story turns on his decisions, and his choices ultimately bring about the resolution. And though the story ends the way most super-hero stories do – the heroes win and most of the villains are captured – it leaves us with a sense that something more has happened. Momentous decisions have been made, and the lives of our protagonists – Matt and Natasha – will never be the same. What about you? What stories do you now look at in a new light? Great recap of these stories! I rarely reread/revisit stories, but maybe it's something I should do from time to time... especially when I'm caught up on my new batch of titles! Thanks for the compliment, Dale. Revisiting old stories is something I recommend every writer do. Now that we're older and (presumably) more educated and have a better understanding of how stories work, it's a good idea to go back and see what made these stories work for you. Of course, there is a downside to revisiting old stories. They may make what often passes for good comic book writing these days pale in comparison.